OP Note: I would greatly appreciate it if you guys could please check out this thread and post your comments and thoughts. <3 thank you! After three seasons, you've made it in to the Ro16. This is how difficult getting to the Ro16 is. Up till now I've been falling out of the Ro32 far too many times. I didn't have an easy group whatsoever but I had confidence. I believed that I could advance as first in my group. Why did you believe that you could advance as first in your group? As I prepared, I got the kind of confidence one doesn't normally expect. It was a great feeling. As I saw who was in my group and began dissecting their plays and thinking about what I had to do, I didn't even sleep properly. It's not because I couldn't fall asleep that I didn't sleep, it's because when I get sleepy and am about to fall asleep, I tend to think of excellent strategies right then and there. What did you think after you saw your group? I knew it wasn't going to be easy but at the same time, I thought that I probably wasn't going to get eliminated this time. This is your first time advancing as first in your group to the Ro16. Originally I wasn't going to make this in to a big thing, but this is also the first time that I won my very first match in the Ro32. I even thought to myself that there was no I way I could lose as long as I won the first match. You lost game one to MarineKing and continued the series. Did the loss have an impact on you? I even contemplated that MKP would go mech. I was wondering whether or not to match his mech build transition or to keep playing as if I was playing a bio army, and then I eventually chose the latter. Unfortunately, that was my downfall. 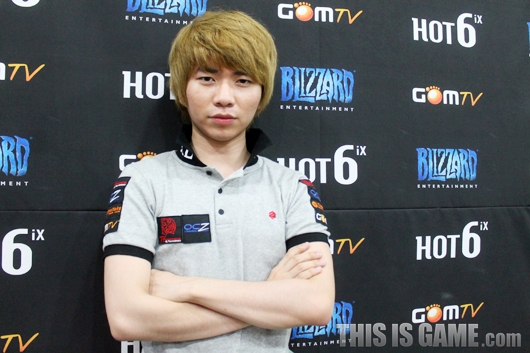 Also, MKP's mech play was superb. But I didn't really feel an impact from the loss. I'd been feeling a lot of impacts from my losses and I've also lost a lot of games since I was completely spent mentality wise, so this time I just focused on my mind control as I played. There was an elimination race in the first game against MC. Did you expect something like that to occur? I was in an advantageous situation so I got nervous and I couldn't even focus properly. And the end result became an elimination race. I tried to think of the best way to win without having to factor in too many variables. That scenario was something I had experienced quite a few times before during practices so I put all my cards in to my spore crawlers and went for the elimination race. In today's match, your mutalisk usage was good. In game two against MC, I really didn't need to use mutalisks but I suddenly got this urge to do so. If MC's army composition had been just a little different it would have been easier for me but my decision to go mutas almost cost me the game. At first, I was in a good situation because I blocked his cannon rush. Will you be able to increase your current record using this season's Code S? If I put in just a bit more effort, I should be able to make it all the way to the Ro8 and Ro4 and ultimately, make it to the finals. To be honest, I'm not quite sure as to whether or not my skills have increased since my practices, but I do know that my gaming plays have gotten better. What is your secret to your gaming plays getting better? It's not secret. I just got better through all my losses. As you lose, you learn so many things. Games are all about winningg and losing but I feel as if I have been losing too many games lately so I told myself this has to stop. I wanted to show what I had been doing in my practices while not worrying about results so I put on that kind of mindset. I also believed that I would advance as first with that kind of mentality. My teammates really helped me a lot with practice. They helped me A LOT. I want to thank all my teammates for practicing with me. The nydus build I used against MKP was a build order taught to me by StarTale_Zero. I am grateful to him for teaching me such a great build. I am glad I didn't waste a good build order like last time when I lost to Puzzle. Lastly, I want to thank our sponsors BenQ, Red Bull, ZOWIE, and Joy Gear. Even though I still don't have that many fans I still want to thank them, my mother, my brothers, and my friends for their unending support. You just barely made it to the Ro16. How do you feel right now? I think I haven't felt like this in a while. I've had to play in three tournaments straight starting from yesterday, but I had no idea I would win all three of them like this. My results were good for OSL and WCG, but GSL was definitely the most important out of all of them. I really had to play all the way till the end and I had to accomplish full sets in all of my matches. Thanks to that, I feel so proud and I also feel like I have to work even harder. Why is the GSL most important? It's the tournament where I made a debut as a SC2 pro gamer and I've also never been able to make it to the finals in over a year. Even my memories about making it to the Ro8 are fuzzy. In order to move on forwards from here on out, I have to win a GSL championship no matter what. You have had to play a lot of matches lately. Isn't it tiring? I've been sleep deprived a lot lately. I even tend to get tired really quickly as I play my games. I've been taking pills in order to fill up my stamina and my practice schedule has also been really tight. I had two tournaments on the same day so I really had no time to practice. I just told myself that I had to take advantage of all these opportunities I was given and that I should play hard to make sure I had no regrets. Rather than focus on my gaming, I focused on stabilizing my mind. You started off with a troublesome situation with a loss to Curious. In game one against Curious, I won easily just the way I wanted to. In game two, I was in a situation where I would have blocked his attack with just one bunker but my hands didn't move the way my mind told it to do. In game three, I played my best all the way up till the end of the game but I ended up losing. After losing the final game, I was feeling really disturbed and I also suffered stomachaches and headaches. But because I focused on stamina for the Up/Downs, I was able to finish today without getting tired even though I had to play full sets. 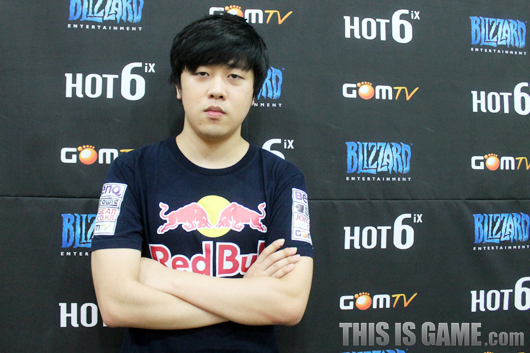 How were your games against Jaedong? You ended up losing game one. This was my first time ever experiencing facing Jaedong. I felt bad that we had to meet in the losers' round but he was a player I had revered back in the BW days and he's also someone who I hold to high standards as much as Flash. I didn't feel anything bad and I just felt honored to face him. Of course I had moments where I didn't perform to the best of my abilities but Jaedong's defending timings and attacking timings were stellar. I realized after my loss in game one that if I didn't pull myself together, I would end up losing to a KeSPA player and that I would get eliminated. We saw a cheese rush that we hadn't seen in a while from you in game two against Jaedong. My strategy in the second game was actually very similar to the cheese rush FanTaSy used against NesTea. If we spawned cross positions, I was planning on just putting on a little harassment as I macroed up but luckily we spawned across from each other. I told myself that there was no way he was going to block this so I attempted it. Lately, you don't seem to do cheese rushes. If it's a bo5 or bo7, I think I would end up using them quite often. But right now, it is still only bo3s so I don't have that many opportunities to show cheese rushes. I also feel like I have an obligation to show fun and great games. Also, I feel confident enough to win without needing to resort to cheese rushes. You seem to always have heated games against MC. Which game was the hardest? In game two, my original strategy was to block my entrance as I attempt a triple CC. But then as I scouted MC, I saw that he had 2 gases. I knew that MC likes to use zealot/blink stalker on Antiga Shipyard a lot so I decided to alter my strategy and go for only a double CC instead. But then MC also switched up his build later on so I felt a kind of heavy weight on my mind. It was sort of the same scenario where I had lost to MC hyung last season during the Ro16 so it was a really complicated situation. This is your fourth straight season making it to the Ro16 but you have no Ro8 record. What about this season? I'm going to lay it all on the line for this season. I'm going to make sure I get in to the easiest group possible during the Ro16 group nominations, get through it easily, and make it to the Ro8 to finally play a bo5. It's been such a long time since I've played a bo5. This season, I really want to get it no matter what. In the OSL, you have to face DRG. The winner advances to the Ro8. I really wanted to advance together with DRG hyung but the situation is like this so I'm very saddened. Currently, my rivalry with DRG hyung is the most impacting and in our most recent head to head, I lost. This time, I want to grab my revenge and make it to the Ro8 for the OSL no matter what. I want to thank MaNa for practicing with me all night long and for coming to the studio with me today. I really want to treat him to something yummy. I had to play 9 games altogether for today's GSL matches so I am grateful to coach Park for always coming to me after every game to give me advice and to make sure I was still solid mentally. Thanks to my coach, I was able to advance to the Ro16. Lastly, I want to thank our sponsors Ttesports and OCZ. damn i want to read mkp's! 6 interviews translated at one shot 0.0! Good interview, but we're all here for MKP! can't wait! So happy MKP pulled through. Also expected Curious to be last in the group. Hah. Huh, interesting that Curious didn't get that BO from Line or Life, seems right up their alley. Definitely helps Curious a lot to throw in BOs like that into his series. You have fans Curious ! I even made a meme collection just for you. Thanks for all the translations, much appreciated as always! Curious and MKP so deserving...man, this Code S is so stacked. Interview is currently 50% translated! A curse for you, a blessing for us! Oh wow, MKP seems to have a lot of respect for MaNa!